Warning: This is unedited for content, so there are a few f-bombs. I guess then that this is rated PG-13. I'm so ready for this session! Great to see Erik again :) Why did MS fire him?! I wanna know all the details please ;D I am reading through G.E.B at the moment and all this stuff resonates beautifully with ideas shown there...It is like everything has been invented already, except it has not, because we can still come up with new ways of reusing old ideas, by applying concepts deeply rooted in mathematics, which in itself is incomplete and instantly evolving according to Godel and others ;) Thanks for the session! @dreameen: Erik wasn't fired... That statement was for dramatic purposes. Officially, he left on his own accord. Just to be clear. And, officially, we miss him. 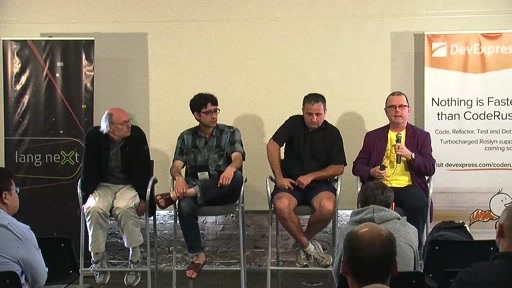 I would be really interested to get the great Bart De Smet's comments on this video. In my opinion, he is RX at Microsoft. Great video and nice to see Eric again. Charles, are you back on C9? @RT1138: I never left C9 (I'm a lifelong Niner, man), but I am no longer on the C9 team... I make content infrequently, but always love to get the chance to when I can. 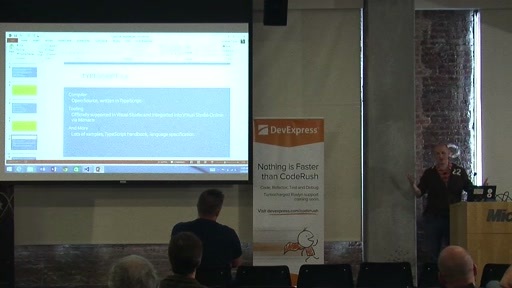 Erik says we should throw away "Design Patterns" because of the error he mentioned. My question: does anybody know one or more correct sources for study? How about a warning that there are some f-bombs in here? I have never seen Erik throw around f-bombs before. Was he careful not to do this before because he was at MS? I must say I enjoy this Erik even more. The MP4 link downloads a completely different talk. It's sad to feel so much grudge in Erik towards Microsoft. He makes a lot of passive aggressive or bad taste remarks towards MS ecosystem that most of the time seem uncalled for. The presentation would've been better with personal feelings being left out of it. @mdonatas:I agree and i do not understand this. 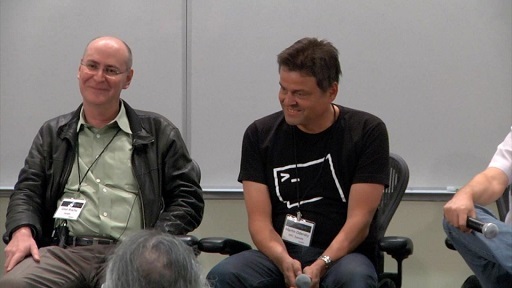 I always enjoyed to watch Erik's interviews on C9, but especially his Haskell series. I am myself european and to say so i personally f.... on f-bombs, but after having worked more than a decade for ms i do not quite understand this aggressive approach towards ms in this talk. @mdonatas: @wandreas: As you know, Erik is fueled by passion and therefore emotion. He has resentment towards MS because of how the relationship ended (it was a breakup more than anything else, an unfortunate turn of events that did not lead to a firing. He left on his own accord, but the circumstances gave him little choice - in his mind - but to leave. That's all I will say on the matter.). 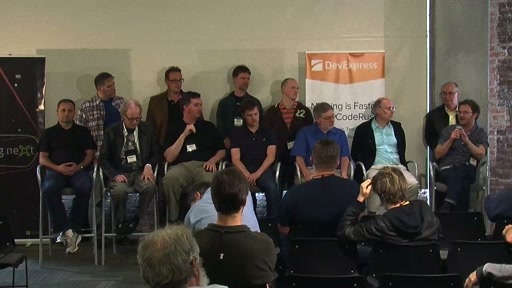 Microsoft is full of people who talk about code and also code. I don't know many people working on products who don't code, regardless of their job title. PMs on engineering teams are often writing code to verify the soundness of their ideas. Testers are software developers.... I don't agree with the statement Erik made about how everybody in Silicon Valley who talks about code also codes, but how that is not the case in Redmond... This doesn't mean I will have it edited from the talk. Hopefully, after all these years, you understand that we don't do that on Channel 9. I think Erik is totally correct! He did a lot to MS, (co-)created many cool and innovative things like LINQ and Rx, and the company didn't recognise his efforts properly. Now, any platform have Reactive stuff - look at the push made by Typesafe with the Reactive Platform. Great! One more reason to be very disappointed. @Fabio Galuppo: Don't drink too much of the typesafe coolaide :) While I love what they are doing, I am not so fond of their attempt to pervert associations like Reactive == Actor, Actor == Typesafe therefore Reactive == Typesafe. Reactive is much bigger than that. 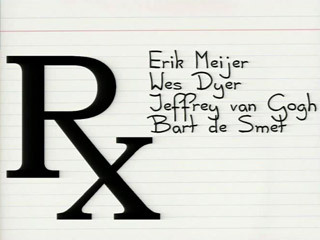 Rx plays his part, which we are all super grateful to Erik (and Bart et.al) for giving us. 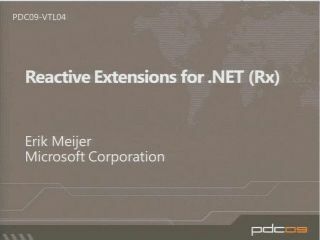 Rx is cross platform now thanks to continued work from MS, Erik and Guys like Ben at Netflix. Another point, this is a canned presentation. It is a well planned and executed and has been performed at other conferences. The firing analogy works well for it's purpose (comedy, marketing stunt and conveying knowledge). In my experience, off stage Erik is a very sweet and passionate person. Thanks for sharing, explaining and moderating Charles. Keep it up! I have always enjoyed Erik's talks before. While I found this talk interesting, I did not enjoy it due to the frequent unpleasant, cynical, unfunny, and sarcastic remarks. For me, being rude about a large company is one thing, but singling out particular people for ridicule is quite another: derisively including Steve Ballmer in his actual code examples is astonishing for someone who should know better and has always managed to behave himself here previously. But maybe I'm just no fun. I'm from the UK, so don't mind "f***" (that word is frequently used around the office). Interesting to know that in the US it is a faux pas. On the technical side I found the modelling of getters and setters as pull and push collections (IE/IO) interesting. In a previous C9 video I believe Erik mentioned his affinity for "first-class" constructs. Mapping getters and setters into these interfaces make them more first-class in a way. So for example one could subscribe to an accessor and listen to "settings" (or "gettings" too, actually). I love that generality. Erik stays fun (and genius) like usual. His new "duality show" is more symmetric. I suddenly realized that this new presentation is structured like the paper "http://www.pps.univ-paris-diderot.fr/~krivine/articles/Agay.pdf". After this comparison, I read now the "enumerator-observer duality" like the "name-value duality" (a good old friend). A good opportunity to read again all Wadler papers. The bitterness of that intro was kind of sad. Passion, code, f-bombs ... this has everything you want and more! Loved it! 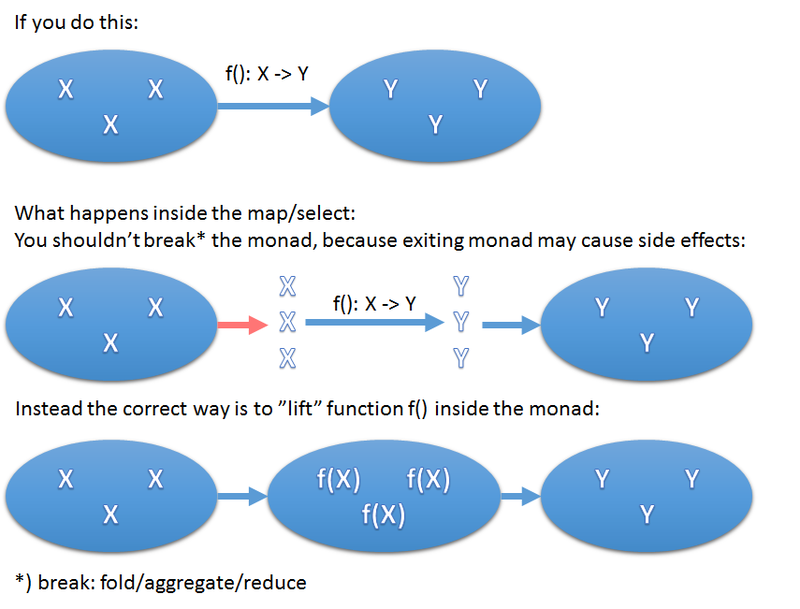 Who is in charge defines in which side of the arrow is the monad-capsule. I would describe lifting like this. I think just based on the general definition of "reactive" that the push idea of observer is more accurate than side-effect. I can understand that Erik may have other ideas to it and prefer a change, but I'm not so sure "side-effect" is better. Both definitions carry a negative connotation in context; however, "side-effect" has a greater negative weight then "reactive". If I had any opinion that mattered, as if... I would say some mathematical terms could be more relevant to describe this evolving pattern, sort of like "state functions" and "integrals"... but, for me.. reactive is fine.